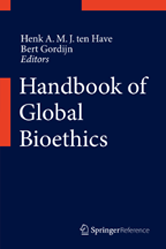 As the first of its kind, this handbook presents state-of-the-art information and analysis concerning the state of affairs in bioethics in around 40 countries. The country reports point out the most important discussions as well as the emerging topics in the field. Readers can orientate themselves quickly with regard to the various relevant issues, institutional structures and expertise available in these countries.